Show prizes were change a bit. Cash prize of $25.00 for best of show and people's choice. $10.00 was given to advanced category. Show was held at Ken Rock Community Center Rockford, IL. 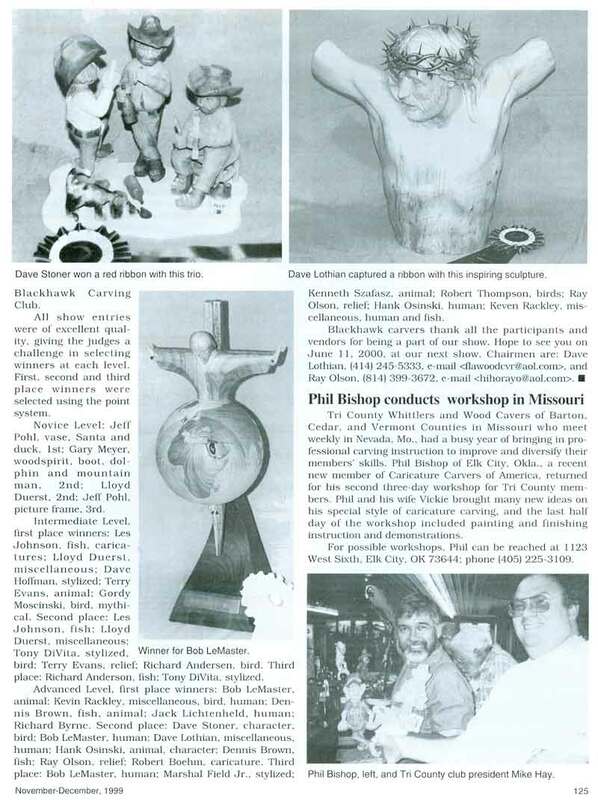 No record of who judged carving show. The club had a contest to create a logo. The logo is an Indian. Gale Terrell won the contest and gave the prize money back to the club. The club logo is still being used today. The club carved a totem pole for the Discovery Center. Jack Litchenheld was coordinator of the project. The Discovery Center wanted faces of all walks of life doctor, lawyer, dentist, teacher, and etc. This was a club project. Club picnic was at Sinissippi Park. December meeting is Christmas party. Refreshment and tool swap and etc. Gale Terrell won the contest for the club logo. I would like to have the following message published in the next Blackhawk Carver news letter that is published. 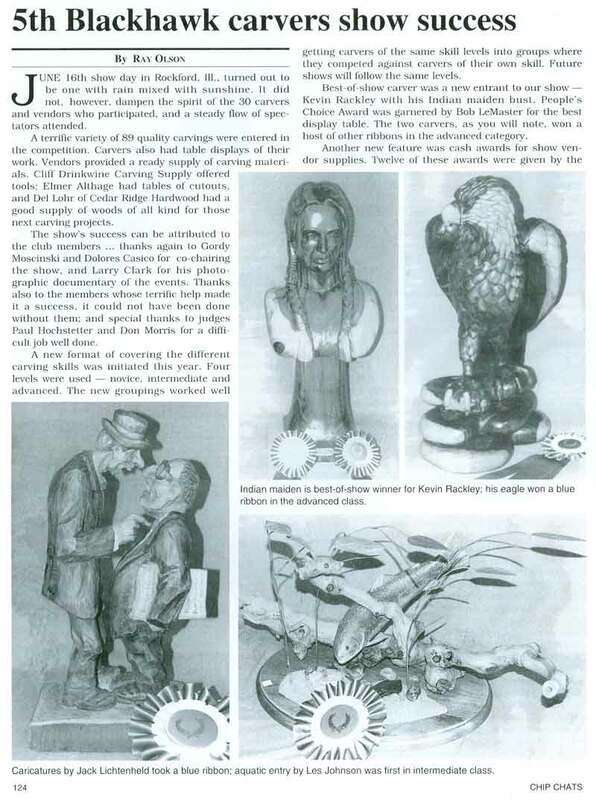 Jack Litchenheld a member of the Blackhawk Carvers has volunteered to head up a carving group to carve a science type totem pole for the Discovery Center. The pole will be about 14ft high and 14 inches square with 4 or 5 character figures. These scientific figures have been defined and will be roughed in by chainsaw. Jack is looking for volunteers to help in finalizing carving the figures. Carving will start in September of this year, the pole to be erected in the year 2000 at the Discovery Center. Here is a great chance to be part of a neat project, call Jack at 963-3466 your help is needed.